Stitched Together: Fibre East 2014 - My Haul! Fibre East 2014 - My Haul! I didn't tell you I went to Fibre East this year, did I? It was my very first fibre festival (I'm not counting the Knitting & Stitching Show because it's not very sheepy) and it is the closest big event to me (around an hour's drive). I thought I wasn't going to be able to go as I didn't have any yarny/fibrey friends local to me who had a car and wouldn't mind shoving me around in a wheelchair all day. I gave up my dream of going until my friend Rachael (who does not knit, spin or weave but enjoys a spot of sewing every now and again) said she would take me. I couldn't believe my luck, someone who I love spending time with was going to take me to somewhere I've always wanted to go. We decided to make a day out of it and went down on the Sunday. We decided not to risk getting something to eat at the event because Rachael is a vegetarian, and I am really fussy about meat, don't eat fish so may as well be vegetarian! I discovered a great pub online and we decided to give it a try, without booking, and if we couldn't get in, there were lots of other places to eat in Ampthill. The place we went was The French Horn at Steppingley and I can't recommend it enough. We arrived at 12.15 and they were fully booked. However, when we said we wanted to get in and out quickly they found us a spot and served us incredibly fast, but didn't rush us at all. The food was amazing and the surroundings were lovely. I really recommend this spot, but I also recommend booking a table, especially on a Sunday, and it wasn't precisely a bargain, though worth every penny in quality! So after we were all fueled up and ready to shop we headed off to the event. The disabled parking was quite close to the entrance but for people with mobility problems, there were till a couple of inclines that weren't easy to get up. I think the people with scooter's probably had to best idea for navigating round the show in between tents and halls, but it was easier with a wheelchair to get into the individual booths and get close to the wares. On Sunday afternoon it wasn't too packed so it was easy to get into most of the stands and there were a few deals to be had, in particular the Blacker Yarns stand had some skeins for half price and there were a couple of other stands who were discounting from their usual price. I'm glad we went on Sunday because the temperatures were a bit cooler than the day before. I was told that the heat in the sports hall was unbearable the day before, so I felt pretty sorry for the vendors in that area. I went with a list of things I wanted to get at the show and stands I wanted to see. Sadly I didn't plan my route well enough so I didn't manage to get to a couple of the tents before my body gave out on me, but I did manage to get a few things I went for. One of the first things on my list was a basket from BasketBasket. I'd seen the store online and thought it would be nice to get one for carrying my shopping in. I didn't actually find any I liked but I've now seen the individual sizes and will be happy to buy one online when I see one in the colour I want. 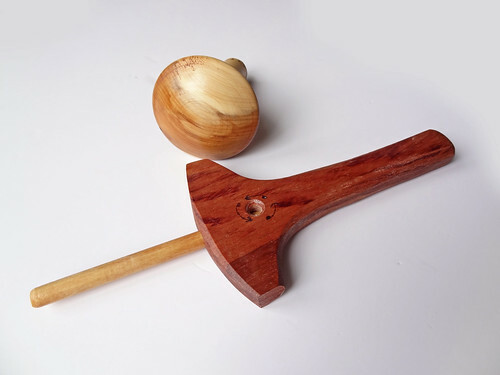 I also wanted to get a new spindle from IST Crafts. I was quite surprised to find all the Tibetan and Russian spindles they had left didn't really sing for me. I suppose all the best ones went on the first day! Ah well, I don't really need another spindle, but I thought it would be nice to buy one that I tried first for a change. The next non-woolly item on my list was an Andean Plyer. I've wanted one for a while and could only find it online from one place in the UK, that ever seemed to have one in stock, Woodland Turnery. I decided to try and pick one up at the event to avoid paying postage. They call the item they sell a Peruvian Plyer but it's the same thing. I also picked up a darning mushroom because I had been thinking about getting one as well, but obviously not enough to get around to actually buy one! I've already used the plyer on a small amount of singles and it worked really well. My technique is probably not all it could be, yet, but I think it will improve. I used this diagram because it was easier to follow than the one that came with the plyer. After buying these tools, everything else that was purchased was squishy! In fact, Rachael got so caught up in the wool fumes at The Knitting Goddess booth that she bought some yarn too! I was, of course, generous enough to offer to knit it for her into something, so I get a total win there - pretty yarn to play with that I didn't have to pay for that will go to someone who loves it! The yarn she got is lace weight and is 70% baby alpaca, 20% silk and 10% cashmere. This yarn is divine, I'm not surprised Rachael craved it! The colourway on the label is Greens. The picture above is a little too blue to be accurate. I just couldn't capture the colour well enough and it is more green teal than the turquoise above. It's gorgeously soft and I can't wait to get the go ahead to cast on a pattern. I've already sent some links to her to choose from. I have plans for all of my purchases. The self striping yarn will, of course be socks. I was so pleased to get this yarn as it is really hard to get the self striping from The Knitting Goddess without stalking the store updates intensely, and I ALWAYS forget! I love the colours of the yarn too, so I was delighted when I saw it. The yarn from Sara's Texture Crafts will also probably be socks, but as the yarn is so lovely it may become a shawl or cowl if the right pattern crops up before it gets knit up. The Islington yarn from Kettle Yarn Co is going to be for a Pebble Beach Shawlette by Helen Stewart. I went into the booth looking for the yarn recommended in the pattern, but got drawn to this yarn instead. I loved the yarn and I think the BFL/silk blend will probably be more robust than the camel/silk blend of the Westminster. The Jumbo Twist yarns in Hematite and in the one of a kind colourway were bought to go together in a two coloured shawl pattern. I have several of those patterns in my queue and I rarely buy two skeins of sock yarn together to work in one project, so this was one of the things I had in my list to buy. The squishy and tightly plyed BFL yarn is very springy and I think will have amazing stitch definition. I think the Jumbo skeins, as opposed to the normal 50g skeins aren't available very often. It's nice to know, however, that you can buy smaller amounts of sock yarn for those striped patterns I like so much, or for colourwork! This yarn will probably become either a Cameo or an Axis. I really enjoyed the Blacker Yarns stall. It was lovely to be able to feel the skeins of yarn that they sell, as it is sometimes hard to choose something from their yarns online. The breeds they use are not the run of the mill sheep that you find everywhere, so it's nice to actually get a sense of the qualities and how they feel personally rather than using someone else's opinion. 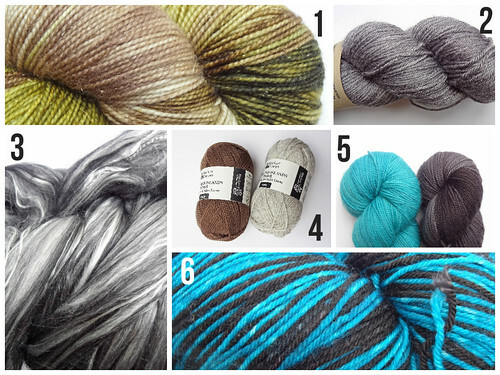 I really like the BFL and the Elegance Range is lovely. I liked the Classic British yarns as a good workhorse yarn too. I couldn't resist the Swan Island Falkland as it is beautifully soft. 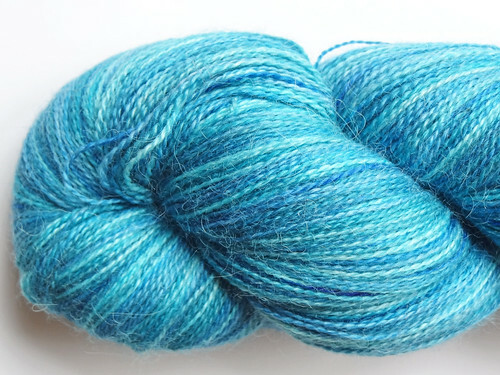 I am a bit of a Falkland fibre fan so it was a bit of a no-brainer for me, especially as the colours were lovely. The two skeins of 4 ply that I chose will be used to make Bedale from the Coop Knits Toasty book I already have. Finally the fibre I bought from John Arbon is amazing. I was drawn to the Alpaca Supreme skeins in the stand and both Rachael and I stood coo-ing over how soft and lovely it was. I was all set to buy a skein when I spotted the enormous sacks of fibre that were on sale and I saw that one of the sacks contained the combed and blended fibre that was spun into the yarn I had in my hand. I went over to the fibre and nearly dove in because it was so soft and beautiful. I bought 200g, and with hindsight, I should have bought more because I've since sampled the fibre and it is the most wonderful fibre to spin. 200g should be enough to knit a lovely big shawl though. I'm very happy with what I purchased at the event, as all the things I bought, were things I intended to buy. As I said, there were a few places I really wanted to visit but didn't manage to reach - Baa Ram Ewe, Fivemoons, Namolio, p/HOP to say hello to Kate's Twirl, of The Golden Skein fame, Skeins, The Knitting Swede, The Natural Dye Studio and Yarn Garden. Sadly, my body didn't wish to participate and I should simply have planned better. However, I did enjoy wandering without plan after looking at the tools, spindles and baskets, and seeing what caught my eye. I actually came home with some money still in my purse and I put more things back than bought. I am becoming much better at these events, probably because I've been looking at my stash quite a lot this Summer and I know how lovely all the stuff I already have is. We really enjoyed our day out and we are already planning a return trip next year as Rachael enjoyed herself too, so is happy to shove me around all day in my wheelchair. I highly recommend this event as a nice day out. I only wish I was well enough to take a course AND shop! Maybe next year I'll try and plan to meet up with people too, though I was glad to meet someone who listens to the podcast and have a nice chat after she recognised my voice (it does carry a bit). As I know we will probably be going next year I'll be able to make more arrangements than this year as I didn't really know we were going until the last minute. I still enjoyed myself tremendously, even without planning. Fibre people really are very nice folks!